Keep midweek meals quick, easy and budget-friendly with this sausage spaghetti dish. We’ve added spinach to the pesto to pack in more green goodness too. Remove the skins from the sausages and fry the sausagemeat in a pan with about 1 tbsp oil for 10 minutes, breaking it up with the back of a wooden spoon and stirring occasionally, until golden and crisp. Cook the spaghetti in a large pan of boiling salted water for 8 minutes or until al dente (with bite). Drain, reserving a little cooking water, then return the cooked spaghetti to the warm pan. 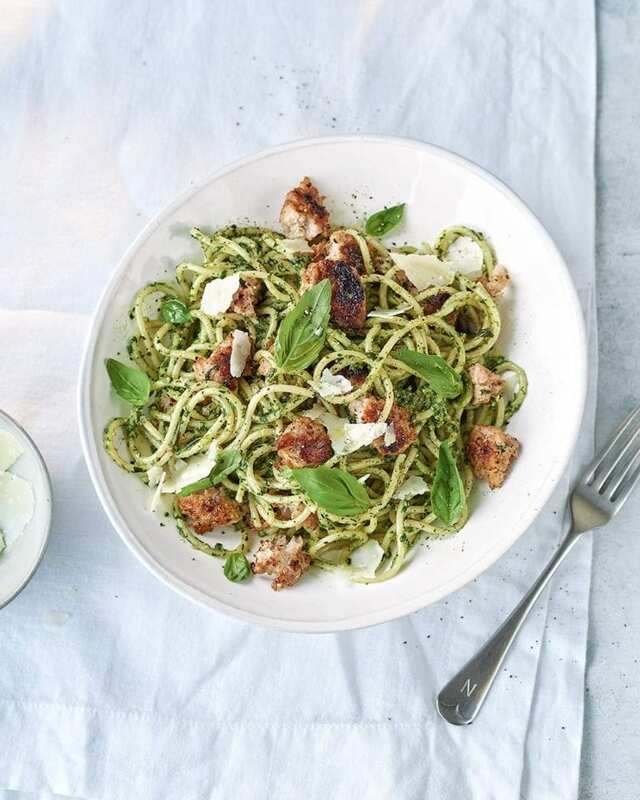 Meanwhile, put the defrosted spinach in a blender with the remaining oil and add the rest of the pesto ingredients, reserving a few basil leaves to serve. Season well with salt and pepper and whizz to a paste, adding a little reserved pasta water to loosen if necessary. Toss the pesto through the spaghetti and top with the sausage, remaining basil and extra parmesan. Next time, swap the sausages for bacon and the spinach in the pesto for frozen, defrosted peas.